The Frenchman was in-and-out of the starting lineup for the league duties in the first half of the season where he was juggled with Alvaro Morata. However, he has not experienced a similar run at the turn of the year with winter signing Gonzalo Higuain being the first-choice to feature in the top-flight. "Of course it's frustrating," he said. "Today, I have the impression there is clearly no competition (for places in attack) since January. It's like that, I know that I will only play in the Europa League." 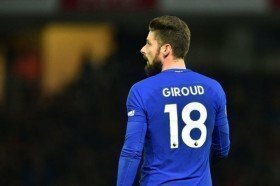 Giroud has just three months remaining on his existing deal but the club have the option of triggering a one-year extension clause. It remains to be seen whether he will be satisfied with the deputy league role.